On our last day in Istanbul our flight left in the evening. Having calculated that we would have to pick up our baggage at around 4 pm to leave for the airport we nearly had a whole day to do some more sightseeing. And the weather was as fine as the day before. This was great because we hadn’t seen the Bosporus strait so far. I had checked in our guide book and it mentioned different option. They said to take a one-way cruise and then to return by bus, stopping at different sights on the way. But we didn’t see any one way cruises and we also found no commuter ferries going up the Bosporus (at least not from Eminönü) so we looked at cruises. There was one which took most of the day and included a 3 hour stay in a village further up the straight. That didn’t sound very interesting and the cruise returned to late for our schedule. So we decided to take a 1.5 hours cruise without a stop. It only cost 12 TL (about 4.50€) and was a good way to get an overview over Istanbul’s water side palaces. And there are quite a few. 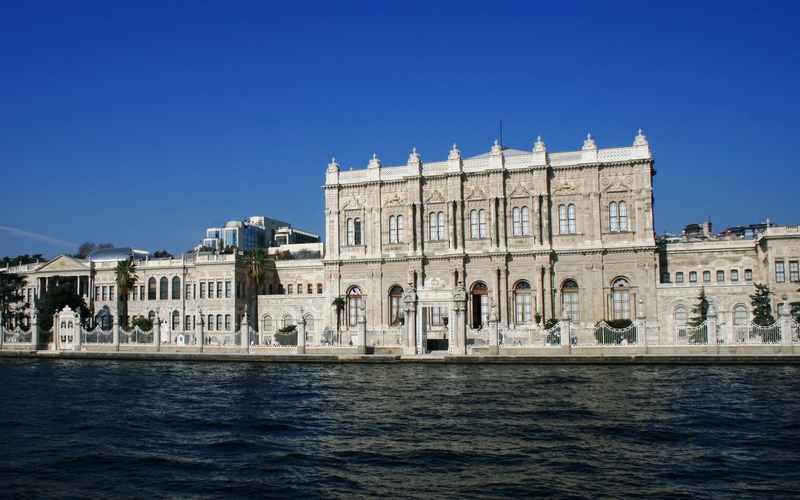 Had we had more time it would have been great to visit the Dolmabahçe Palace or going for a walk inside the Rumeli Hisarı, an old fortress further down the Bosporus. 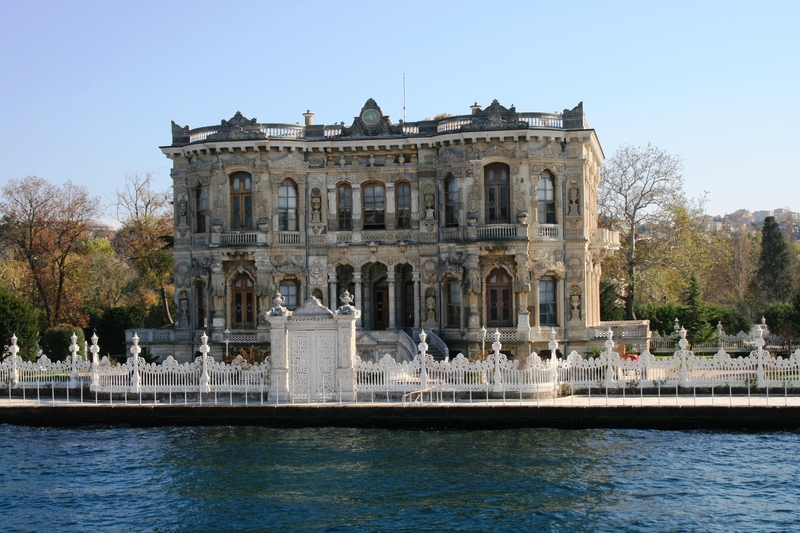 It was really interesting to seen how many splendid palaces and villas were built so close to the water and I really wonder if there is never a flooding in the Bosporus because the buidlings are so close to the water. 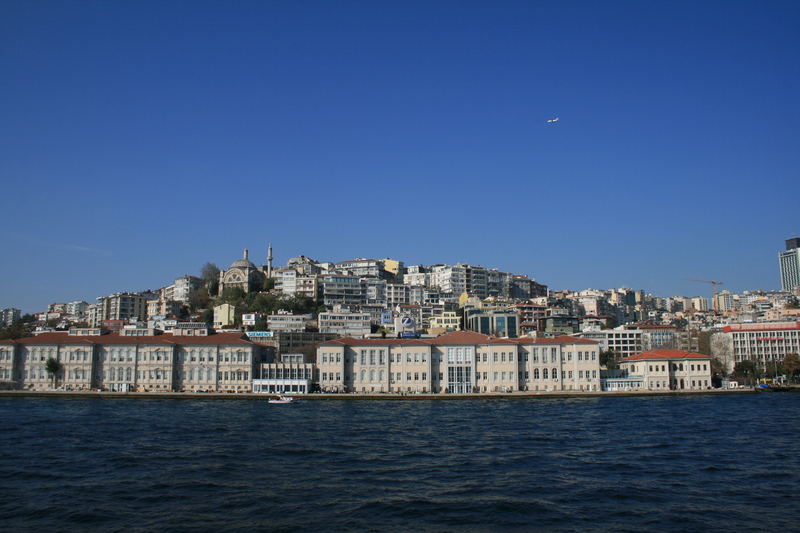 They didn’t look as if the sea level used to be lower and the Bosporus not as wide ore anything. Back again in Eminönü we walked through the quarter below the Grand Bazaar, turning a bit west and always up the hill to get to the Suleymaniye Mosque. On our way up we stopped for lunch. We went into a small place in the streets near the Bazaar. It was as local as it can get with a buffet where you could choose from many cooked dishes. It was defiinitively the cheapest meal we had during our whole stay in Istanbul: Two dishes full of different stews and a big plate of rice for only 15 TL! 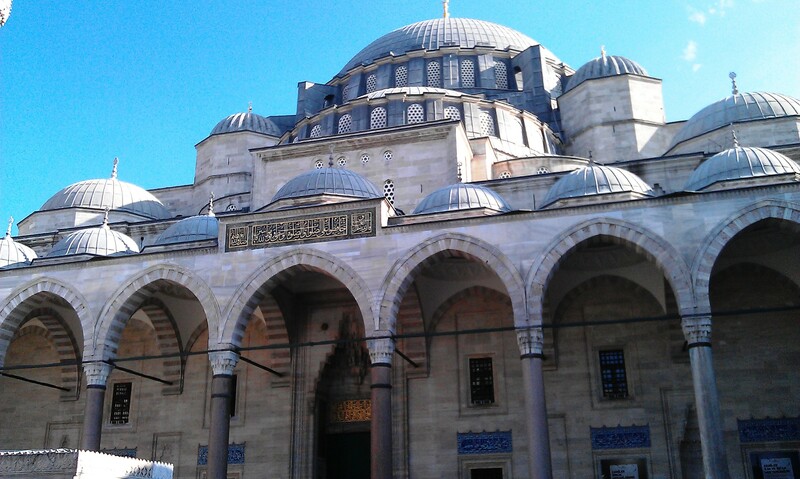 After passing through the Univerity of Istanbul area we reached the mosque. Even though this one is not very far from the other touristy places in the old city, there were only a few other tourists exploring this huge mosque. And even better than the inside was the view from the surrounding terrasse. Now it was already early afternoon and we decided to walk back to our hotel and check out the little Aya Sofia. This tiny church now mosque was located just streets away from our hotel and is a little gem. It is even a little older than her big sister. 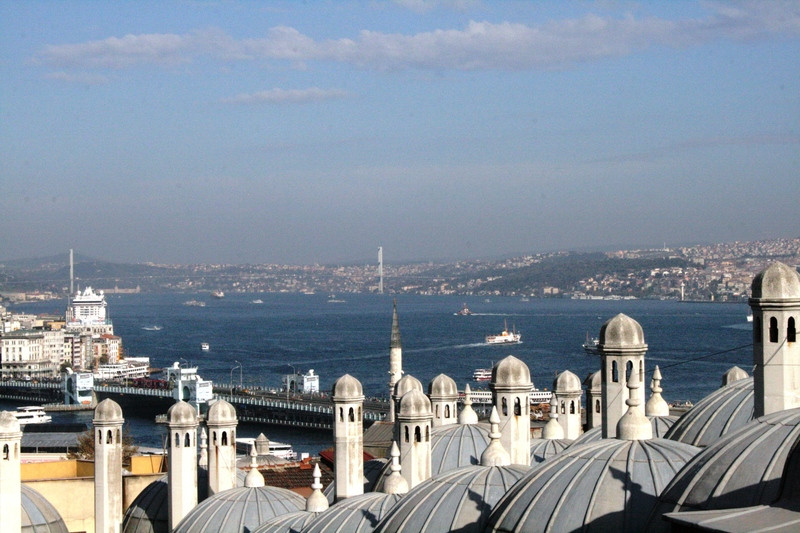 Very few tourist get here even though it is just 5 minutes from the blue mosque. We had a turkish coffee in the court belonging to the mosque and could count the visitors on two hands. And with this ended our trip to Istanbul. The way to Atatürk airport wasn’t as long as the one to Sabiha Gökçen but it was a bit unconfortable because the tram was super crowded as was the metro during the first few stops. But that is what you get if you travel in the rush hour. 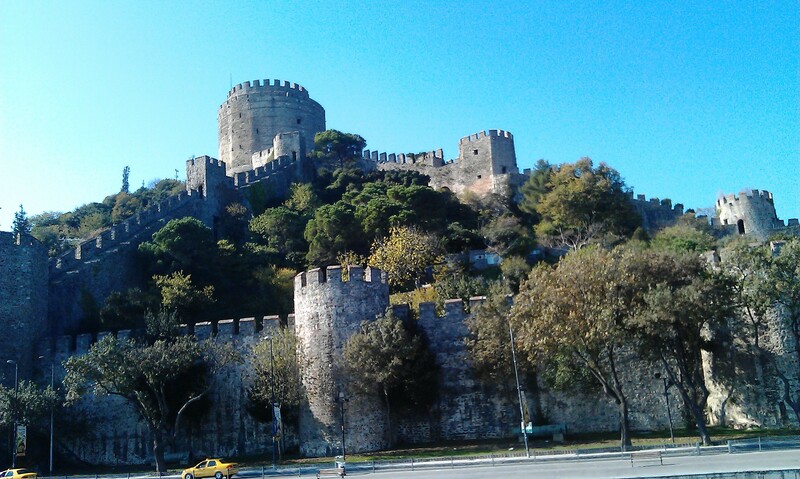 Check out all we did in Istanbul here. 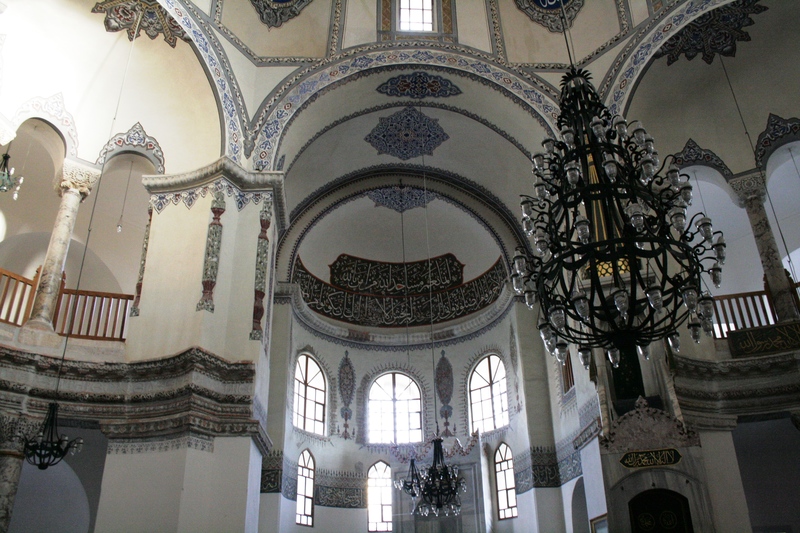 This entry was posted in Turkey and tagged Bosporus, Istanbul, Suleymaniye Mosque by kathatravelling. Bookmark the permalink. oh, Istanbul!! We began a Greek Isle tour here a few years ago…and I never dreamed I’d love this city so much! We weren’t here nearly long enough (just one day! )….must go back. Your photos make me want to make the return trip SOON!